2017 brought 12 fillies and we will be catching up on how they have changed over the past few months. Starting with our first foal of the season- Charm City Girl! At 7:10 am on January 9, Charm City Girl gave birth to our first foal of 2017, a beautiful filly by Uncle Mo! 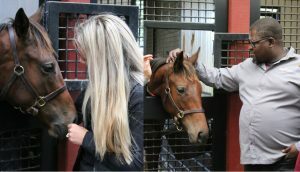 She is Charm City Girl’s first foal and is part of the 5th crop of foals for champion sire, Uncle Mo. 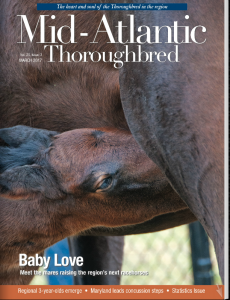 Charm City Girl ’17 was featured on the front cover of Mid-Atlantic Thoroughbred in March of 2017. Charm City Girl ‘17 is now a 670 lb weanling who is full of personality. “She hasn’t changed much since she was a foal. 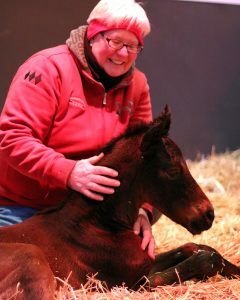 She’s really sweet and friendly, but has a business-like attitude,” said Debbie Moorefield, broodmare manager at Sagamore Farm. Charm City Girl ’17 welcomes the Plank Industries new hires with her charm. Debbie with Charm City Girl ’17 after being foaled.